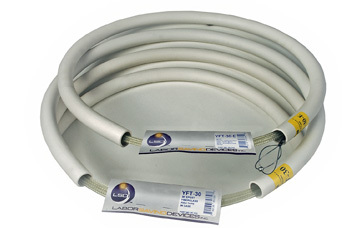 The YFT series of fiberglass fish tapes are designed for use in wire installations within conduit. Constructed with FIBERFUSE™ fiberglass, the YFT flexibility and shape memory is superior to typical “duct rodder” products, providing smooth transitions in conduit having difficult curves and 90 degree bends. The YFT is small in diameter (0.120”) and is able to run through pre-wired or crowded conduit. /n The YFT is available in two lengths: 15ft., and 30ft. Each YFT has a fixed bullnose end and comes with a 1ft. ball chain with snap-hooks.